PLASTFOIL® ECOPVC membrane PLASTFOIL® ECO — Reinforcement membrane for middle climate. Energy saving - white color or standard - grey color. Installation temperature till -15 C.
PLASTFOIL® CLASSICPLASTFOIL® CLASSIC — Reinforcement membrane for cold climate. Installation temperature till -20 C.
PLASTFOIL® LAYPVC membrane PLASTFOIL® LAY — Reinforcement membrane. Have a texture (anti-slype) structure. PLASTFOIL® POLARPVC membrane PLASTFOIL® POLAR - Reinforcement membrane for arctic climate. Have highest frost resistance and strongest for sea salt. Installation temperature till -25 C.
PLASTFOIL® ARTPVC membrane PLASTFOIL® ART – Without reinforcement membrane. High flexibility. Using for details and connections. PLASTFOIL® GEOPVC membrane PLASTFOIL® GEO – Without reinforcement membrane with signal yellow layer. For underground constrictions and green roofs. 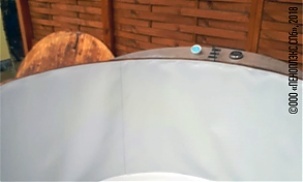 A high-quality PLASTFOIL® ECO waterproofing membrane with a thickness of 1.5 mm was used to equip a Japanese bath in a private house in Gdynia (Poland). The international electrical company E.NEXT (Electrical Newest Exclusive Extended Technologies) equipped the roof of its warehouse located not far from Kiev with an area of 4000 m2 with a reliable waterproofing material PLASTFOIL® Eco with thickness of 1,5 mm. The roof of the Premier Hotel Odessa (Ukraine) with an area of 2500 m2 is equipped by means of efficient polymeric waterproofing membrane PLASTFOIL® and high-quality thermal insulation PENOPLEX® made of extruded polystyrene foam. Reliable waterproofing polymeric membrane PLASTFOIL® Eco with a thickness of 1,5 mm protects the roof of the Prestige confectionary factory in the Bulgarian city of Veliko Tarnovo. In the Polish city of Lodz, the terrace of one of the private residential houses is protected by a high-quality waterproofing polymeric membrane PLASTFOIL® Eco with a thickness of 1.5 mm. The business center at the address: pr. Pobedy, 67 in Kyiv is protected from precipitation by a reliable Russian-made polymeric membrane PLASTFOIL®, which covered the roof of a building with an area of more than 2,000 m2. The total area of the depot buildings with PLASTFOIL® polymer membrane is around 60 thousand square meters. The construction should be completed in 2017. The OPTIMA system was used as a technical solution. 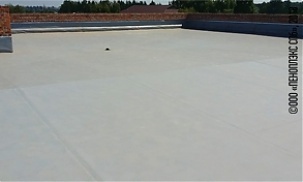 The roof was waterproofed with PLASTFOIL® Classic 1.2mm polymer membranes. More videos about the use of PLASTFOIL® polymer membranes can be found in the "Video Gallery" section. 30 years of service life without repair is POSSIBLE! PLASTFOIL® polymer waterproofing contains high-quality plasticizers, which makes it resistant to frost, flexible with low temperatures and ensures the integrity of the material at low temperatures. PLASTFOIL® PVC membrane may withstand frequent freezing and thawing without any hinderance of its performance. PLASTFOIL® PVC membrane is easily connected by a flow of hot air with the use of automatic welding machines. It is not required to use open fire when installing the membrane. PLASTFOIL® polymer waterproofing does not contain any harmful impurities and additives. It is environmentally friendly and safe for human health. PLASTFOIL® polymer waterproofing contains special UV stabilizers which make this material resistant to ultraviolet radiation. PLASTFOIL® PVC membrane does not change its technical characteristics when exposed to sunlight, and it does not change its color or fade. © 2011 — 2018 LTD "RVK"